I bring this security tip to bear due to continued mounting issues we see when our clients use Yahoo. There are three separate pitfalls that users of other web portals and email services have not had yet to encounter to the degree of Yahoo users. Email hacks from the back-end. Think you have the strongest password in the world? Do your security questions involve fictional places and mythical creatures? It does not matter when the email server is directly broken into, which happened four times in 2013. Yes, it’s happened in 2014 as well. Yahoo.com delivers malware straight to you – how convenient! In January of this year, users launching their browsers and landing on Yahoo.com were instantly exposed to malware that Yahoo was pushing through their advertisements. This occurred for several days before Yahoo became aware of the issue. Sitting on the receiving end one did not even need to click on the advertisements – once the screen had loaded, hello malware. Search results will offer you adware before what you’re really looking for. 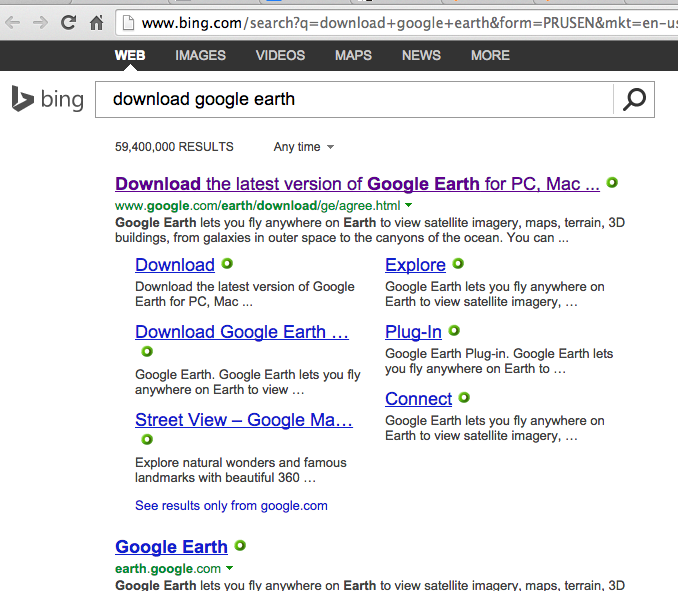 A few weeks ago a client (using Yahoo as home page) decided to download and install Google Earth. Should be a quick, easy, harmless evolution, correct? 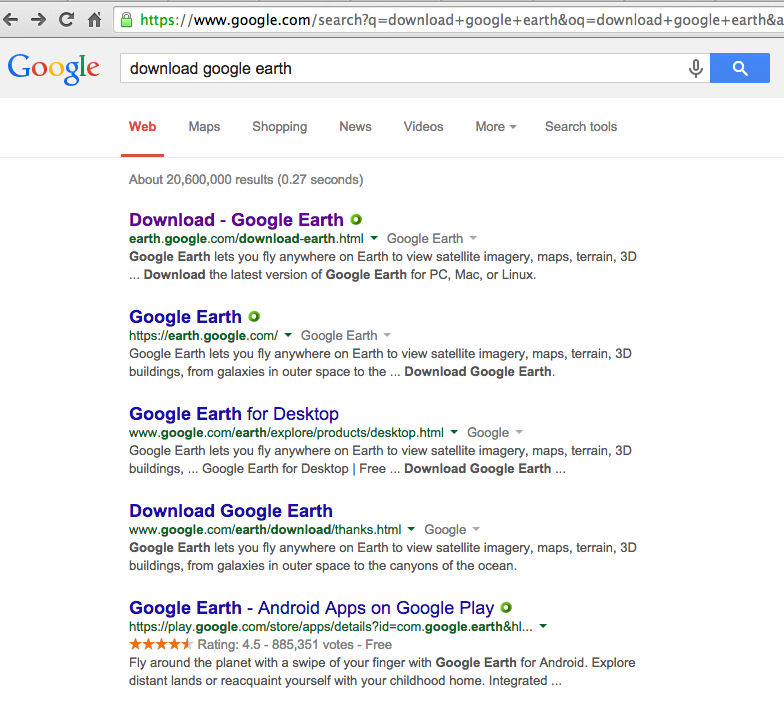 Sadly the client (again, using Yahoo) had searched for “download google earth” and clicked upon the first link that Yahoo served up. It’s after the fifth search result down the page that we actually get to the true unadulterated software that we are looking for. Unfortunately for the client having placed trust in Yahoo they had chosen the first result, which I do have to mention did get him Google Earth – but along with it eight adware / pop-up programs which we were called in to remove. Google’s results for this particular search may be somewhat jaded as we are searching for their own product. Nonetheless the first five results here lead us straight to the desired software. 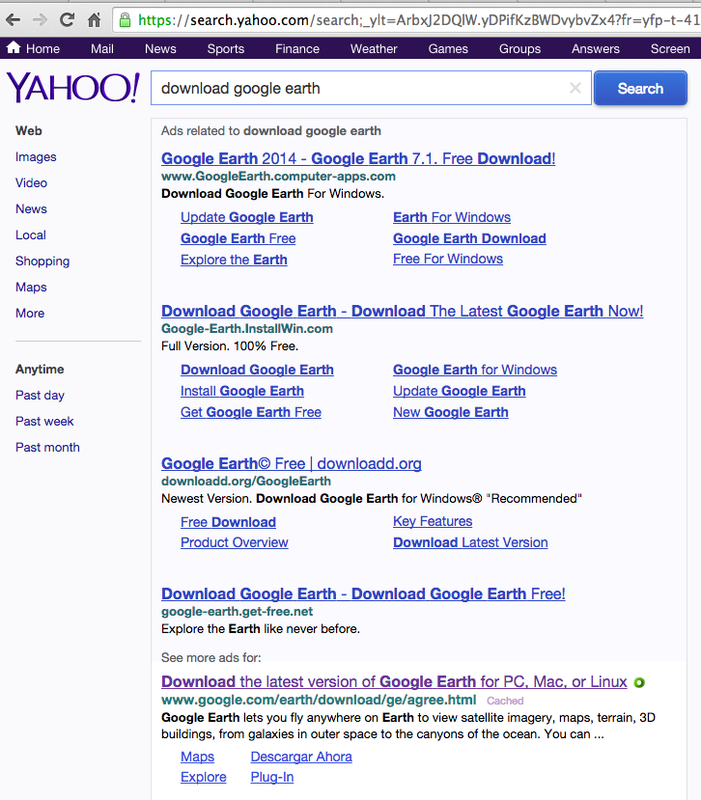 Ask yourself this (and please do not use Yahoo to search for the answer) – if you’re still using Yahoo, why? This entry was posted in Education, Security and tagged email, Google+, MSN, Search Engines, Yahoo. Bookmark the permalink.